Model of the Butterfly-Wing Bridge, proposed Southern Crossing of San Francisco Bay, Frank Lloyd Wright, 1949. 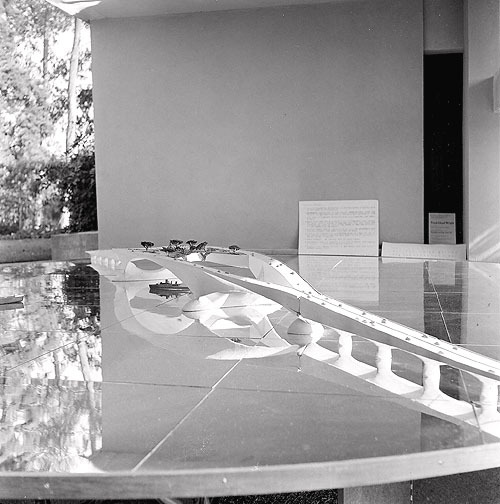 Part of the exhibition Sixty Years of Living Architecture, Los Angeles, 1954. Photograph © Loch Crane. Source: The Wright Library. In 1949, the architect Frank Lloyd Wright sketched a futuristic concept for what he called the Butterfly Wing Bridge. This was Wright's design response to a surge of Bay Area interest in building a second Bay Bridge somewhere to the south of the first one — a dream that became known as the Southern Crossing. The San Francisco-Oakland Bay Bridge was only a decade old. But, by the mid 1940s, auto traffic across the new bridge already was 2.7 times greater and trains across the bridge were being used 50 percent less than had been projected in the 1930s, when construction of the bridge was a getting underway. The Bay Bridge was congested — and something would have to give. Clip from Herb Caen's column, San Francisco Chronicle, 2 January 1947, p.9. Click image for PDF of the full page. Source: San Francisco Public Library. I hearby resolve...[t]o suggest that the second Bay Bridge be named after Emperor Norton, who was the first "crackpot" to come up with the idea. Surely, others must have expressed the idea, before 1947, that a bridge across San Francisco Bay should be named after the Emperor — but this may be one of the earliest published records of the idea. Clip from Herb Caen's column, San Francisco Chronicle, 5 March 1947, p.13. Click image for PDF of the full page. Source: San Francisco Public Library. Shouldn't that second Bay Bridge, if any, be named after Emperor Norton — who first thought our puddle about 75 years ago? Clip from Herb Caen's column, San Francisco Chronicle, 29 April 1947, p.13. Click image for PDF of the full page. Source: San Francisco Public Library. [I]f that second Bay Bridge is ever built, why shouldn't it be called the Norton Bridge? He had the idea 75 years ago. Here, Caen adds the name: "Norton Bridge." Based on a search of the San Francisco Chronicle archives, though, it may have been another 13 years before anyone made it into print with the suggestion that the original Bay Bridge — the Emperor's bridge — be named the "Emperor Norton Bridge." Letter to the Editor from D.J. Stevens-Allen, of Berkeley, Calif., San Francisco Chronicle, 12 July 1960, p.26. Click image for PDF of the full page. Source: San Francisco Public Library. And here we are, 57 years later, still trying to get this done. Next year is Emperor Norton's 200th birthday. There's never been a riper time to name the Emperor's bridge for the Emperor. Let's make this happen in 2018! For an archive of all Campaign blog posts and a complete listing of search tags, please click here.